Dzata is regarded as the spiritual home of Vhavenda. This is due to the fact that Dzata is the ancient capital of Venda. This is where the Singo conquerors first settled when they conquered Venda. The Singo settled at Dzata I (one), on Mount Lwandali which overlooks Dzata II. Dzata I was abandoned after the death of King Dimbanyika. Oral history has it that Dimbanyika was a hunter. One day he went out hunting but never came back. But his two dogs went back home. A search party, led by one of his dogs, was dispatched the following day to look for him. The dog led the search party to a cave. The opening of the cave was filled with huge rocks which were impossible to move. After trying unsuccessfully to move the rocks, they were addressed by Dimbanyika. He told them to stop trying and that the cave would be his grave. He instructed them to move the capital since nobody would be allowed to live on Mount Lwandali. He forbade people from eating fruits from Lwandali. He also gave instructions that the son of Rambwapenga and his descendants must remain on Mount Lwandali to tend his grave and to be guardians of Lwandali. The Singo moved to the south west of Lwandali and built a new capita, Dzata II. Up to this day the descendants of Dimbanyika are not allowed to face the descendants of Netshiendeulu since it is believed that the descendants of Netshiendeulu possess supernatural powers bestowed by Dimbanyika. When Khosi Netshiendeulu goes to Dzanani to pay tribute to the Mphephu-Ramabulana King the two have to converse not facing each other. They are also separated by a wall, and they both need to have their backs against the wall that separates them. This practice is also due to the belief King Dimbanyika and the son of Rambwapenga (Netshiendeulu) could not see each other when Dimbanyika was trapped in the cave, and when he was issuing instructions. The Mphephu-Ramabulana King is also, therefore, supposed to issue instructions to Khosi Netshiendeulu without the two seeing each other’s face. Dzata was abandoned after King Thohoyandou’s disappearance. Thohoyandou’s brothers, Ravhura and Raluswielo (Tshivhase) refused to pay tribute to Thohoyandou’s son, Munzhedzi. King Munzhedzi relocated to Mount Sunguzwi (known today as Songozwi), present day Makhado town. Dzata is today a national monument. A Vhavenda museum has been built at Dzata. 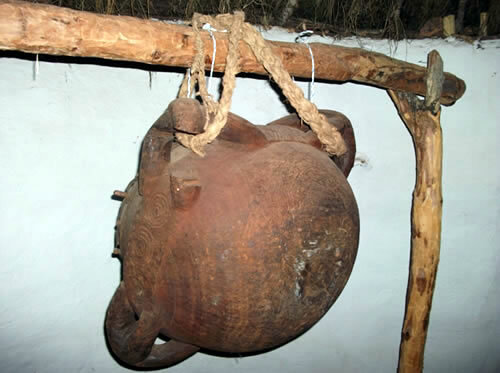 A replica of Ngomalungundu: Dzata Museumt.